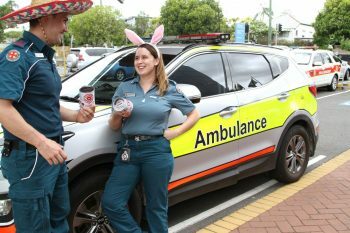 The Queensland Ambulance Service has seen the trauma many children face when the head to hospital, so its members were happy to throw their support behind a cause which is designed to help young patients smile again. Radio Lollipop’s Uniform Free Day on the East Coast of Australia on Friday March 8, is all about having fun while raising funds to keep our volunteers on the air and by the beds of children in hospital. For the cost of a gold coin donation, Paramedic Kent Jackson and Emergency Medical Dispatcher Emily Mildred added a little colour to their work clothes – and the money raised by dressing up will help supply our team of play makers with the tools they need to distract vulnerable young patients. Games and craft supplies are always in high demand as an outlet to keep young minds active and little hands busy while confined to bed. The music, competitions and fun from our live radio program also soothe nervous listeners as they request, and sing along to, their favourite tunes. But while our wonderful team of volunteers at Queensland Children’s, Mater, Logan, and Gold Coast University Hospitals donate an endless supply of time and talent to young patients, we still need support from the wider community to keep our programs running. Please encourage your colleagues or classmates to wear a colourful costume on Uniform Free Day, this Friday March 8, to raise awareness and funds for Radio Lollipop, so we can help pave the road to recovery with laughter and fun.